The primary aim of The Fabry International Network (FIN) is to facilitate collaboration between Patient Organisations to support those affected by Fabry Disease. It seeks to do this primarily through enabling communication, promoting good practices and acting as an independent forum for Fabry Associations. 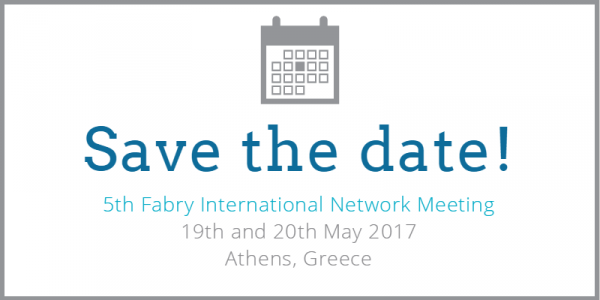 The fifth Fabry International Expert Meeting is taking place on May 19 & 20, 2017 at the Royal Olympic Hotel in Athens, Greece. This meeting includes patient stories, updates, and facilitates collaboration between Patient Organizations to support those affected by Fabry Disease.